As a kid, or as most kids that I know, I tried to emulate my favorite sports heroes. Being a kid once, I had one of the most locally significant hero that any kid would be lucky to come across. Earvin 'Magic' Johnson was a Michigan State Spartan, and to watch his exciting approach to the game, and his showmanship made me feel like their was something extraordinary about this man. I tried to emulate the no look pass, and the flashy assist. I became less uncomfortable being one of the tallest players on the team and taking over a point guard role. However, I never met him, and he seemed not only larger than life but rather iconic due to my inability to hear and see news about him being that it was pre-ESPN wackiness with repetitive highlights and reports on what a player had for breakfast. My father was a traveling businessman, and was on a flight from Detroit to Los Angeles in the 1979-'80 time frame. It was near the time when Magic was drafted by the Lakers. Magic was on the flight and my dad began to talk to him about our family, and what me and my brother were doing. My brother and I were given the slip of paper with Magic's autograph, but it was the memory of what happened ten years later that will stick with me. Around 1990, near the end of Magic's career, or 10 years after my father's first encounter with Magic they were on another flight together. 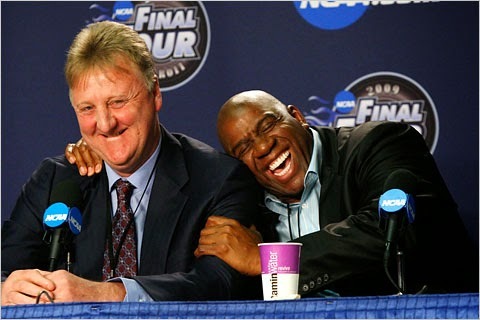 My father briefly told Magic that they were on a flight together 10 years ago, and without being prompted, Magic Johnson asked, "How are your two boys?" as acknowledgement that he remembered. That story always brings joy to my heart, and when I see Magic flash that infectious smile it always brings a smile from me in return. Remember, as a coach or a player, treating everybody as they are important or sometimes even just humane will be something that will become habit, and can make an impact on someone you don't realize you've made an impact. Picking and choosing who you make a choice to make feel important can limit the amount of practice and range of influence locally or worldwide. Remember the old time book by Dale Carnegie, How to Win Friends and Influence People, I do not feel, like working on your free throws, that you can be effective without practicing being genuinely concerned or caring for others no matter what worth they may present. It can help in recruiting, and being recruited, but most important how people that come in contact really see you as a person. Is it Probable You will Lose?